Ellen Sussman and Elizabeth Stark, both acclaimed authors and writing teachers, have put together two wonderful five day events. 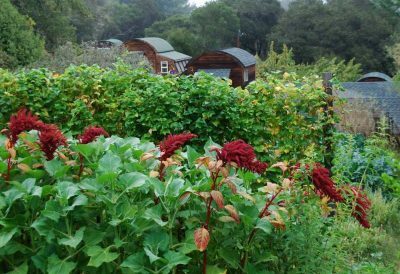 Held in the gorgeous setting–gardens, pond, meadow and woods–of the Occidental Arts and Ecology Center, just 70 miles from both San Francisco and Oakland, August 8 – 12 & October 10 – 14, 2018, these will be intimate, inspiring, enormously creative and productive adventures. Baffling mysteries, chilling tales of horror, alternate universes, speculative futures, heart-pattering romance, heart-thumping thrillers, wrenching tragedy, biting satire, magical realism. All of these offer insights into the magic of story that we can use to propel our own stories in unexpected ways. There may be sections of the bookstore you gravitate towards, genres you loved early that shaped who you are, forms that drive your own writing. The great writers beg, borrow and steal from everything that intrigues them–and in this camp we are going to do the same. Scene is what hooks us: what happened? Who did that? Scene makes the reader lean into the story, refuse to put down the book, dream the tale we put on the page. We know this and yet opening the images and ideas of our stories into wonderful, fleshed-out, vivid scenes challenges all of us. This camp will explore what “show, don’t tell” really means in the books we love–and in our own writing. Create unforgettable scenes that pull your reader into the story and don’t let go.